From his youth he pitted himself against the old masters. He suffered from angina pectoris and died after Christmas 1950 struck down by a heart attack at the corner of 61st Street and Central Park West in New York not far from his apartment building. Well-read in philosophy and literature he also contemplated mysticism and theosophy in search of the "Self". In the 1920s he was associated with the New Objectivity (Neue Sachlichkeit) an outgrowth of Expressionism that opposed its introverted emotionalism. 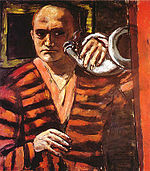 Max Beckmann (February 12 1884 – December 28 1950) was a German painter draftsman printmaker sculptor and writer. Although he is classified as an Expressionist artist he rejected both the term and the movement.